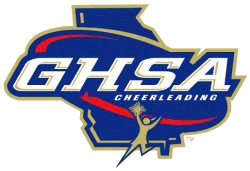 GHSA is offering a new competition in cheerleading called Game Day, in partnership with Varsity Brands, Inc. This event will be held at Putnam County High School on February 23 beginning at 9:00 a.m. Admission is $12 per person at the venue. The divisions will be A-3A, 4A-5A, and 6A-7A. Teams will compete in areas they use to lead a crowd at a game on "Game Day" at a football or basketball game. There are three segments on which they will be judged: cheer, band chant, and fight song. The teams scoring the highest in these three segments will be the finalists and will then combine all of these areas in an additional three-minute routine. Varsity Brands will have event merchandise available. Wristbands will be given to spectators so that they can come and go during the event. We do ask that you have your wristband on your wrist. Concessions will be offered at this event. Concessions will be CASH ONLY, credit/debit cards or personal checks will be NOT accepted. When you arrive for the event, sides of the gym will be labeled with either A or B. The teams will perform facing the same side all day, so you as spectators will not have to move at any point during the day. Here is the information on where to sit to ensure you see the correct team.